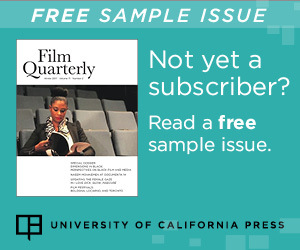 Film Quarterly | Film Quarterly offers serious film lovers in-depth articles, reviews, and interviews that examine all aspects of film history, film theory, and the impact of film, video, and television on culture and society. Racquel Gates and Kristen J. Warner are colleagues and soul twins who enjoy applying their expertise in race and media to popular culture debates. One such conversation arose —inevitably—around the release of Marvel’s Black Panther directed by Ryan Coogler. "FQ" the Film Quarterly podcast presents SUNDANCE EDITION 2018. Meheli Sen, Nilanjana Bhattacharjya, Monika Mehta, and Anupama Kapse on the Netflix Bollywood anthology film Lust Stories.